Note: Can also use Skinless whole Chicken cut in to pieces. 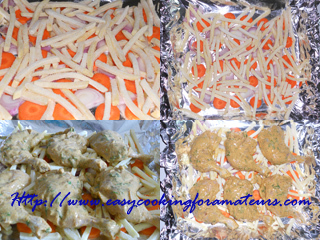 Note: Can also use 1 large potato cut into strips or diced Instead of frozen finger chips. Wash the chicken & squeeze out all the excess water. Make deep slashes in flesh (both side) so marinate penetrates inside. If using whole chicken for small pieces prick the flesh all over with a fork. Keep aside. In a bowl add all the marinate ingredients & Mix well. Note: Red food colour can be used but I don’t prefer using colour. Add chicken rub the marination so it reaches deep inside the slashes & all over. Add oil, mix & rest it for a 1-2hr. Preheat the oven to 450F or 230C for 10 min. Make a base. Spread carrot, onion & finger chips. Note: I like to make a base to avoid chicken from sticking to tray & keeps marinate attached to chicken & keeps the chicken dry from the dripping fats, this base also gives good aroma to the chicken. Place chicken on top of it. Place tray in the oven. After 15-20min turn it to the other side. It takes about 30min to 45min or cook till it turns brown & dry. Make sure to check in between. Note: Cooking time may vary depending on the thickness of chicken. Those who like to barbecue they can grill the chicken on it, in the middle keep brushing the chicken with oil. 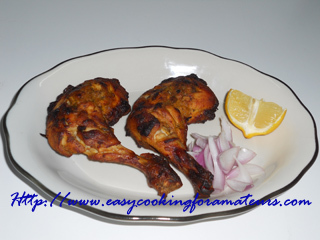 Tandoori chicken is ready to serve with onions & lemon wedges. Looks delicious love the base. Mouthwatering here, inviting tandoori chicken..
Oh yummy, one of my favorites! @appi,Thanks & belated Vday wishes to u & ur loved ones. 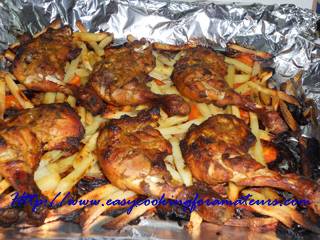 I remember eating tandoori chicken once or twice but I never got a hold on a good recipe. Yours seems like the perfect one so I have to thank you for posting it. I can’t wait to try it.